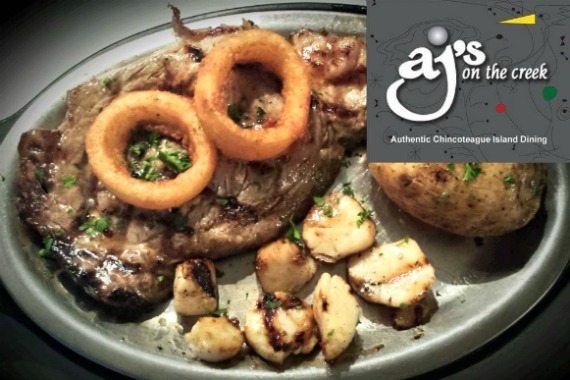 For generations, the folks at AJ's have been passing down delicious seafood recipes from parent to child. We specialize in historically great seafood. "This is how you beat the lunchtime blues." "Pictured: Our crab Alfredo. " "Life's not perfect, but your meal can be." "Where good days become great." "The secret ingredient is guest feedback. http://bit.ly/2F1yzOU"
Ken was our waiter and you could not find someone better. We had 6 appetizers and they were all delicious. The Delmonico steak was out of the world as was the filet mignon. Highly recommend you stop if you are on the island. Looking for great seafood, this is the place. The seafood bouillabaisse is awesome. Extremely Kid friendly. Yes, I'd like to receive news from AJ's On The Creek. Sign up for the AJ's On The Creek Newsletter!